If you’re reading this you’re probably dreaming of sinking your toes in soft, white sand while watching palm trees sway while relaxing at the Disney Aulani Resort. I also would say to start dreaming of snapping that photo of your kiddo floating around the lazy river or even hugging Moana as tight as can be. Let’s make sure your memories don’t become nightmares. These Aulani tips will help make sure you have an amazing family vacation to Oahu! Our family were welcomed as guests of Disney for our Aulani vacation, all thoughts and photos are my own. Aulani is about 20 miles away from the Honolulu Airport. There is traffic to take into consideration, so be mindful of busy work traffic times when planning your flights and/or transport. We arrived in the afternoon with no morning or evening traffic woes and so it only took us about 30 minutes to get to the resort. There a few transportation options for how to get to Aulani from the airport. You can book a van service with Hele Hele Shuttle for $24 per person (one way) for a shared van service. Or you can book a private car service with Platinum Limousine, costing about $192-$275 (one way, includes gratuity) depending on the number of passengers and size of the vehicle. Dang’s Limousine is a popular company for private airport transfer. Another option is to take Charley’s Taxi for a flat rate of $55 from the airport to Aulani. The taxi would be the most economical choice, but we had the private car service and it’s a lovely way to travel and arrive. The private car service will also meet you at baggage claim and help with your bags. If you have an early or late flight, you can ask for access to the Luana Lounge at Aulani. The lounge has restrooms, showers, lockers, dressing rooms, computers and a television. The layout of Aulani is fabulous for families because of its compact layout. The resort is shaped a bit like a “U”. The lobby, shopping, and Makahiki restaurant are at the bottom of the U. The two arms of the U are where the rooms are located. And the beach at the end of the U. In the open middle, called Waikolohe Valley, is where the other restaurants and pools are located. One of the reasons we loved this layout for families is because the resort feels compact and not so spread out. As the daughter of a teenager, we found comfort in allowing her to explore on her own with friends around the resort since it feels so enclosed and sheltered. Disney also put a lot of thought and care in creating this resort to help showcase the Hawaiian culture to its guests. Their motto is “Hawaii first, Disney second”. They put a lot of thought and care into the Hawaiian culture at Aulani. There are two classifications of room types at Aulani. The standard rooms are called rooms and suites. You can book a standard room, 1-bedroom suite, signature 1-bedroom suite, and a signature 2-bedroom suite. There are also villa rooms at Aulani which are part of the Disney Vacation Club. However, villas can be booked without using the vacation club. Only the signature suites and villas have kitchens. There are 1, 2, and 3-bedroom villas. Listen to our Vacation Mavens podcast about using DVC points for your family vacation. One of our favorite things to do at Aulani was play in the pools. We had two favorite spots, the main Waikolohe pool which has a lazy river and waterslides, and the Ka Maka Grotto pool. The lazy river (Waikolohe Stream) is actually pretty long and we enjoyed floating around and around. The girls also gave the waterslides a try. One is a tube waterslide for 1 or 2 persons, which is fast and a lot of fun according to my youngest. The other slide doesn’t use a tube and is a dark slide with twists and turns. The grotto pool has a bit of an infinity edge and fun Little Mermaid’esque theming. This is a smaller pool and can get busy since it is so picturesque. There’s also a jacuzzi nestled under some coral at the grotto pool, which I’m sure attracts parents who want to relax and keep an eye on their kids. There is also an adults-only pool located near the Laniwai Spa. There are two kids splash zones at Aulani. The first is the Menehune Bridge and is more of a playground structure with water play components. While the Keiki Cove Splash Zone is a puddle splash zone, perfect for toddlers and babies. There is also an adults only pool, which is located near the spa and the pool bar. There is also a snorkeling spot in the Waikolohe Valley called Rainbow Reef. This is somewhat like a jumbo aquarium for guests to snorkel in and guarantees your kids will see tropical fish. There is an additional fee for this experience. The pool lounge chairs fill up fast. It’s almost impossible to find a lounge chair by the pool in the middle of the day, you certainly won’t be able to find multiple ones for a family. Plan to either head down early in the morning or stay after dinner time if finding lounge chairs is important. Another tip is to head to the beach. We had no problem finding lounge chairs in the sand during our August visit. We fell in love with the beach at Aulani. Aulani is located in an area of Oahu called Ko Olina. Ko Olina has some natural as well as man-made lagoons along the beach, which helps keep the ocean calm and protected. The lagoon at Disney Aulani was perfect for calm water sports like paddle boarding and snorkeling, also making it great for families. I already mentioned above that if you really want a lounge chair, the beach is where you should head. We had no issue finding lounge chairs for our family of four during our trip. There’s also a snack shop, Little ‘Opihi’s – Beachside Kiosk, where you can get some food as well as beer, wine, and cocktails. If you do want to do some beach activities you can rent beach gear from Makiki Joe’s at the beach. They have Boogie boards, sand toys and life jackets available complimentary for Aulani guests. You can also rent snorkel sets for $20 per day and stand-up paddleboards for $39 per hour. Beach chairs and umbrellas are complimentary for resort guests, but you can also rent a beachside casabella (2-seat lounger with awning) for $75 per day (same-day reservations available on a first-come, first-served basis for use between 8:00 AM and 5:00 PM). If you’re planning to snorkel at the Rainbow Reef, you’re allowed to use those same snorkel sets at the beach. There is also a Target and Costco nearby, so you might consider buying a snorkel set if you have easy access to a car and have kids that want to snorkel everyday. You’ll start seeing that during sunset the beach is a popular spot for families to get family photos taken. Photopass photographers station themselves on the beach to help snapshots of your family to remember your vacation. Be mindful of packing coordinated outfits if you’d like to get a family photo with a beautiful sunset backdrop during your visit. Dining at Aulani is fairly straightforward. Do note that it’s resort dining, not all-inclusive. There are ten eating spots on the property, varying from fine dining to grab n’ go. Reservations are accepted at two of the ten restaurants. I highly recommended (read this as DO IT) making reservations if you want to eat at Makihiki and ‘AMA’AMA. Makahiki is a buffet style restaurant that is also where the character meals take place. They have a daily Disney Character breakfast, as well as a Menehune Mischief Character dinner offered on Sunday, Monday, and Thursday. Reservations can be made online in advance. ‘AMA’AMA is a fine dining restaurant with beautiful oceanfront views. You will pay a premium price to dine at ‘AMA’AMA and there is a dress code. It’s also good to know that the lunch and dinner menus are different. Seven of the ten dining options are all quick service places. Off the Hook is the only other sit down restaurant on property, and doesn’t have reservations. Lava Shack: Stock up on snacks, beverages, sundries and other merchandise at this poolside shop. Little ‘Opihi’s – Beachside Kiosk: Satisfy your appetite with grab-and-go selections as you unwind at Ko Olina Beach. Mama’s Snack Stop: Satisfy your craving for a quick meal or savory snack at this quick-service poolside eatery. Pāpālua Shave Ice: Cool off poolside with a fruity, refreshing shave ice—a popular Hawaiian treat. The ‘Ōlelo Room: Savor cocktails and traditional island appetizers at this upscale lounge inspired by the Hawaiian language. Ulu Cafe: Savor delicious self-serve items or cooked-to-order specialties that you can take to go or enjoy on our covered patio with an ocean view. Wailana Pool Bar: Sip, dine and relax at Wailana Pool Bar, located in the adult-exclusive pool area. Off the Hook: At this laid-back, pool-adjacent lounge, grab a quick lunch or an evening bite and enjoy a full bar and enchanting ocean views. The Ulu Cafe also has a pizza station that is extremely popular, so be prepared to wait about thirty minutes for your pizza. There are refillable mugs offered at the resort. And you can get your Hawaiian shaved ice fix, topped with a Mickey head even! One of my best money saving tips would be to plan on preparing some of your own meals in your room. Of course this is much easier if you staying in a bedroom villa, not a standard room. The standard rooms and suites have small fridges, but the villas have a full kitchen. If you have a car you can drive one exit over from the Ko Olina exit and find a Costco, Safeway, and Target. If you don’t have a car, you can walk across the street to the Ko Olina Shopping Center where there is a store called Island Country Markets. This store has a good selection of groceries (imagine less than grocery but more than gas station), as well as tourism trinkets and a hot food counter. You can also find other great Ko Olina restaurants in the area. In addition to the pools and beach mentioned above, there are also lots of activities for the whole family to enjoy while at Aulani. This is the “kids club” for the resort. Kids explore Hawaiian culture, art and music—with a dash of Disney magic—at this supervised activities club for kids ages 3 to 12. Most activities are complimentary, but some experiences have a fee. You should definitely pre-register your child(ren) before your trip. You can do it as early as 90 days before your trip (no later than two days before your trip). When you register you can choose their extra play activities. If you wait too long to register your kids, the fun activities might be full. When you register your child you’ll pick which activities to enroll in. There are also two premium experiences you’ll can pay extra for and you’ll have to register those separately. You should also know that your kids will need a “magicband” for admission into Aunty’s Beach House. You’ll have to buy this on your first visit for $12.95. However, if you keep your receipt, you can return the band with you receipt for a full refund. This band is what is used to check your kids in and out of the kids club. Seeing as I had a 13-year-old daughter on our visit, I was hoping she’d find enough to do. I was pleasantly surprised! First, there are organized teen activities. Each day there are about three activities for teens – you’ll find them listed on the daily ‘Iwa. The first time you’ll need to sign your teen(s) in and they’ll be given a wristband. This wristband will allow them to participate in all the other teen activities during your stay. Another surprising benefit to the compact format of Aulani is we felt comfortable giving our teen freedom to explore. Her and another teen friend went to the pool together, down to the beach, and did the teen activities. She loved having some freedom and independence on our trip. Every day at Aulani there are many family activities and classes happening. You’ll need to check the daily schedule since activities are signed up for on the same day. Some of these activities are ukelele lessons, character drawing classes, Hawaiian crafts, hula lessons, and mini-canoe racing. The activities fill up! Don’t make the same mistake we did and show up shortly before the activity thinking you can join in. You have to sign up for the activities in advance, and read that as early as possible. On our final day we had finally figured this out and I showed up ten minutes before the opening time for the Pau Hana Room – Community Hall. That’s where you sign up for activities. Check the Daily ‘Iwa to see what activities are offered during your stay. Here’s one activity which Mia loved, and I had fun doing with her. We signed up for the Menehune Adventure Trail at the Pau Hana Room. You are given an iPad mini to start your high tech hunt around Aulani. Aunty leads kids around the grounds with fun riddles and quizzes. Along the way Mia loved seeing magical lights and fire effects. And I was happy that there was some Hawaiian culture weaved into the hunt. You can actually play this game more than one time which we didn’t understand on our first adventure. I recommend that you plan to do the hunt at least twice, and especially at night.There are two trails, one indoors in the lobby and the outdoor grounds one. You’ll be provided the device for one hour. You can choose to stop or continue during the game after every four or five clues. After you stop you can always check out a device again and try again. Read my full post about the Aulani luau! There is an additional expense and you buy tickets beforehand. The Aulani luau is different than the other two I’ve been to in that it’s much more of a Disney experience. The story is more of a Disney story vs being a history lesson. There are also a lot of fun hands on activities available before the luau starts, which our whole family loved! If you book the character breakfast, you’ll probably meet three characters. You’ll meet Mickey when you check in for your reservation. We met Minnie at our two breakfasts, as well as Goofy and Pluto separately. You can also find characters around the resort, we met Moana! FYI, Moana is not Hawaiian…she’s just visiting from her home Polynesian island of Motunui. Pin trading also takes place at Disney Aulani, which surprised us. Mia is a pin trader and we were sad we left her pins at home. There’s a phone number listed on your daily ‘Iwa for characters. You can call to ask what characters are visiting that day and where you might find them. If you’re able, I highly recommend taking a day to explore more of the island of Oahu. We borrowed a friend’s car for our day, but there is also an Alamo rental car desk in the Aulani lobby. Aulani also offers a great number of island excursions that you can book at the hotel. Check out my list of Top 10 Fun Things to Do on Oahu. Some of my favorite things to do in Oahu are hiking Diamond Head, and driving to the North Shore for some famous shrimp. Also stop in Haleiwa to get shaved ice at Matsumotos. Aulani is about 20 miles west of Honolulu, so be mindful of rush hour when planning flights. Charley’s Taxi offers a flat rate of $55 from the airport to Aulani. Ask for a keycard for the Luana Lounge if you have an early or late flight. Pool chairs fill up fast – go early or head to the beach instead. If you’re into snorkeling, pack your own snorkel sets or buy locally as they’re $20/day to rent. Pack coordinated family outfits and take advantage of the photopass photographers to get a family photo on the beach at sunset. Make reservations for Makahiki and ‘AMA’AMA, you can do it online before your trip. There’s a daily character breakfast at Makahiki, and a character dinner at Makahiki three nights a week. You can buy a refillable mug at the resort for unlimited soda refills during your stay. Save money on food by buying groceries locally. Pre-register your kids for Aunty’s Beach House kids club up to 60 days before your trip. Check the daily ‘Iwa online or with the paper flyer to see what activities are available around the resort. Activities fill up so sign up in the morning, as soon as the Pau Hana Room opens, on the day of to be sure you’ll have a spot in the class. Try the Menehune Adventure Trail activity at night to see the light and fire special effects. If you really want to meet a specific character, call the number on the ‘Iwa to ask when they might be visiting. Pack your pins if you’re a pin trader as many cast members have pins and trade. Rent a car or book and excursion to get a feel for more of Oahu during your trip. There you have it – my best tips for Disney Aulani all in one post. 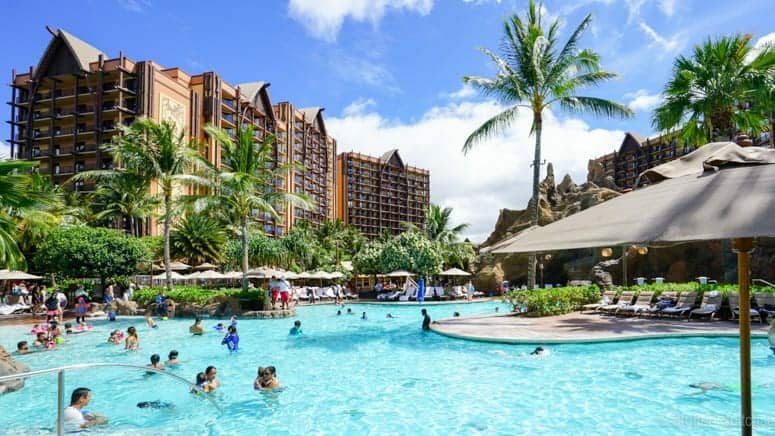 I hope this post will help you plan an amazing Aulani vacation and help make sure you come home with smile-worthy memories. What a great resource!! This answered all my questions about the Aulani and now I want to go!! Love the pictures too. Thanks for this review! Do you think going for two nights would be worth it? We’re going to the big island in March for at least a week but I’m thinking about adding a stop on Oahu since return flights are easier/less points out of Oahu. What’s the best value way to book for a family of 5 (3 adults (including my mom), 2 kids (5 and 8). Hi Kristin – thanks for asking! Hope I can help a bit. If you’d like to enjoy the pools and beach, two nights would definitely be great. You’d also have time to do a character breakfast and the kids might enjoy some time at the kids club. In my opinion it will be the hardest trying to do the family activities, the kids club, and hang out at the pool & beach. So, you’d probably need to pick your favorites, or just really carefully plan your timing in advance. However, I do think it would be worth it if you’re not taking on a heavy transportation expense. We stayed in a 1 BR villa and it would possibly work for your situation if your mom would feel comfortable sharing a front room with the kids for sleeping. If she’s not too tall, she could sleep on the short twin murphy pull-out, or she could share the queen-size sleeper sofa with a child if that works better. The 1 BR Suite has a similar layout, but adds in a half bath and full bath, where the 1 BR villa only has the 1 full bath. Feel free to write back with any other questions you might have! Be sure to check all the promotions they’re running for Aulani to see if they work for your travel dates! This was such a great vacation. Hope to go back again next year! Agreed! Our whole family had a fabulous time and we’d definitely love to return! I travel to Oahu frequently and still haven’t made it to Aulani. Your tips are super helpful! Can’t wait to take my Ohana there soon. Aloha Nadia – thanks for stopping by! Our first Hawaii trip was to Maui! We stayed on Kaanapali. I’d love to go back soon. Aulani is wonderful and I’m happy my tips we helpful and hope you can visit there soon!